Capt. Hamilton Murrell, the commander of the Missouri, makes this statement: "We left London with a general cargo for our first trip to Philadelphia on March 28. We had a fair passage up to 1:20 P.M. of April 5, when we sighted the steamship Danmark flying a signal of distress. The wind at the time was blowing strong from the west. We bore down on the steamer and found her disabled. Capt. Knudsen, her commander, reported that the tail end of his shaft was broken, and he wished me to take his passengers to New York. Owing to the state of the weather, and because of the fact that I was not prepared to accommodate such a number of people, I declined to accede to his request, but offered instead to tow his vessel to the nearest port. This offer Capt. Knudsen accepted, and at 3:20 P.M., or two hours after we first sighted the Danmark, we placed a tow rope on board that vessel and proceeded slowly, turning to the sea and wind, and heading northwest for St.John's, NF, which I considered he best port to make under the circumstances". "The wind blew with tremendous force all night, and progress was most difficult. On April 6, at 5:30 A.M., finding that I could make no progress in a westerly direction, and seeing ice to the windward, I decided to abandon my hope of reaching St.John's and determined to make for St. Michael's, one of the Azore Islands. I signaled my determination to the Captain of the Danmark, and he agreed that this was the best course to pursue, and one hour later we squared way for St. Michael's. At 7 A.M. the Danmark signaled to us:"
"We are leaking considerably. There are now three feet of water in the aft hold, and it is gaining rapidly." "I asked what I should do, and the signal came, "Keep on towing." "
At 9:20 A.M. the Danmark again signaled us. This time the signal read: "The Danmark is sinking. We must abandon the ship. Will you take our passengers?" Without a moment's hesitation I signaled back: "Yes, I will take all on board and do the best I can." I then cut the towline, and we dropped down to the Danmark. "Chief Officer Glen of that vessel came on board the Missouri and informed me of the condition of his ship. He said that although the weather at the time was fine, Capt. Knudsen had decided that for the best interests of those on his ship it would be better to abandon her and get all the people on board the Missouri while there was plenty of time. At. 9:30 A.M. we launched our two lifeboats, in charge of Second Officer Lucas and Third Officer Forayth, and these two boats proceeded to the Danmark." "In the meantime, seven of the sinking steamer's boats were manned by the crew of that steamer and the work of transferring the passengers began. 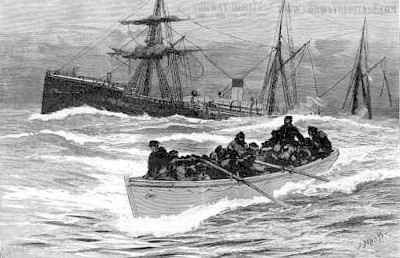 A heavy swell was running during all of this memorable day, making the work of removing the people from the sinking ship one of great difficulty, and it was only by the hardest kind of work that we were able to avoid accidents both to the people and to the boats. The women and children were removed first and after them the male passengers and crew. The officers of the Danmark remained on board their vessel." "At 2 P.M. we finished the work of transferring the passengers, having consumed nearly five hours, and getting everybody with the exception of the officers safely on the Missouri without a single accident of any kind. About one hour later the barometer began falling. The weather was coming in thick and looking dirty. I sent word to Capt. Knudsen and his faithful officers to leave the ship and come on board the Missouri. After getting some provisions from the Danmark, which had now settled very perceptibly in the water, that vessel was finally abandoned. Capt. Knudsen being the last to leave his ship." "I then counted heads and found we had on board, in addition to our own crew of 45 men and 4 passengers, 669 cabin and steerage passengers and 69 of the officers and crew of the ill-fated steamer. After we had taken everybody from the Danmark, we pulled the plugs out of the bottoms of that vessel's boats which we had used and left them to sink to the bottom of the Atlantic. I can't understand how the Minnesota picked up one of these boats six days later. Our last view of the Danmark showed that vessel to be rapidly going down, her stern being almost even with the sea, and the water was breaking over her. We threw overboard most of our cargo between decks, consisting principally of baled rags, in order to make room for the accommodation of the large addition to our passenger list." "On looking over our provisions we found, after a careful estimate of the number of mouths we had to feed, that we had only enough food on board to last three days, and I decided to make all possible haste to reach the port of St. Michaels, which was 720 miles away. The cabin passengers of the Danmark were given accommodations in the Missouri's passenger cabins, and the officers gave up their cabins for the use of the women and children." "On April 7 at 1:20 A.M., about ten hours after the transfer was made, Mrs. Linnie, aged 18 years, a pretty little Danish woman, who was on the way to America to meet her husband, gave birth to a girl in my cabin. The little stranger was christened Atlanta Missouri. The child was born during a howling storm, which rocked the vessel and caused the sea to break over us." "We had started for St. Michael's with all on board at 5 P.M. on the 6th. The weather was very threatening at that time, and the wind increased in violence as the night wore on. Everything possible was done to make the passengers comfortable. Awnings and sails were brought out and used as a partial protection to the panic-stricken emigrants, who for the first time showed signs of fear. All through the trying times, which had preceded this storm, they acted admirably. The gale kept increasing in fury and there was a tremendous sea running, which was continually breaking over the vessel, and, taken altogether, things looked dubious." "It must be remembered that we were very short of provisions, and this storm at the very outset of our journey toward St.Michaels made me fearful of reaching that port safely. By daylight of April 8, however, the gale had materially decreased, and we were able to make fine progress. The 9th went by without incident, and at 9:30 A.M. of April 10 we arrived at St. Michaels. On April 11, at 11 A.M., we landed 370 of the passengers and crew of the Danmark, including Capt. Knudson, at St. Michaels. In dividing up our load, we kept on board the Missouri the families, endeavoring as far as possible to leave the single men and those not having children at St. Michael's. At. 6 P.M. of the same day we sailed from St. Michaels with 365 people from the Danmark, including 8 of the crew of that vessel, who were allowed to come with us." "We had fine weather all the way to Philadelphia and a remarkably small amount of sickness on board, considering the crowded condition of our boat. We have now three cases in the hospital-Carl Jenson, a Norwegian, bound for the West, who has a severe carbuncle on his face, a baby, ill with pneumonia, and a Scandinavian who has some trifling ailment. The officers cheerfully gave up their quarters for the use of the women and children, and the best of good nature has prevailed the entire trip. We had plenty to eat on the voyage from St. Michaels here, having taken on a supply at that place amply sufficient to last us." "There was never a jollier tar aboard a ship than Capt. Hamilton Murrell of the Missouri appeared to be today. He was the lion of the day, indeed, and through all the excitement and bother incident to so great a responsibility as he has had upon his shoulders for the past sixteen days he was the same affable, big hearted mariner, who had a kind word for everybody, and whose modesty never for one forsook him. To hundreds who showered their congratulations upon him he had a bright smile and "Oh well, anybody would have done the same; I'm only sorry I couldn't do more"." The trip of the Missouri up the Delaware River was a pleasant one throughout, and when she landed at her dock at 6 o'clock the Captain was almost sorry that his humane mission was at an end. The steamer had picked up on her way up the channel several tug leads, representing representatives of the Thingvalla Line, of Peter Wright & Sons, the agents, and of the leading newspapers of the country. Everybody was hurrying to and from, getting what little of their possessions they had been able to save from the sinking steamer, and although they were for the most part strangers in a strange land, among a people whose tongue was unknown to them, they displayed upon their ruddy faces ever sign of joy at reaching terra firma sound and well. All of them had the same story to tell in reference to their treatment on either boat, the Danmark and the Missouri, and all were unstinting in their praise of the valor and chivalry displayed, which to their minds made up largely for the enforced delay of their voyage. Just before arriving at the pier, a florist's agent boarded the ship and searching out Capt. Murrell, presented him, on behalf of several prominent ship owners and citizens, with a handsome floral ship, the hull and the rigging being composed of pink roses on a sea of evergreens and trimmed with silvered sails. It was a complete surprise to the Captain, but he recovered himself and accepted it in a few words, wherein his modesty again played a prominent part. "I thank you" said he to those who had gathered around him, "for offering, because I appreciate that this is not alone intended for me, but for the brave men who surround me." It has been said that there are no more British sailors, but I have been convinced on this trip that the British sailor still lives. I speak for my officers and men when I say that we are very glad indeed that we were able to do this much for these poor people, but any one else under the circumstances would have done the same. I thank you for mussel, for my officers, and my crew for the kind way in which you have received us in Philadelphia, and I am happy to state that I have brought all here safe and well with the exception of one little baby, who, when the doctor sees it, will, I think enable us to present a clean bill of health. A cheer went up as the rosy-cheeked, weather-beaten Captain finished his little speech, and he retired to his quarter. The case of sickness referred to was that of Sigvard Martin, a five months old girl, who has been suffering with pneumonia of rather a mild form, which is not likely to terminate unfavorably. She, with the youngster who was born within a few hours after the Danmark's passengers had been transferred, will carry through life a remembrance of her birth in the name of Atlanta Missouri Linnie, were the pets of the ship, not only among the passengers, but of the Missouri's crew as well. Capt. Murrell took a great interest in the youngsters, particularly in Miss Atlanta Missouri, and when he was asked to be allowed to see the child,(2) which was in the second mate's quarters, he was obliged to decline with a smile. "I can stand all this "pumping" as you call it," said he, "but I'm afraid our little baby might not survive the shock of seeing so many newspaper reporters. We guard her jealously, you know." Among the passengers there were so few who could talk in anything but their native language that it was a difficult matter to obtain from them an intelligent story of the accident which befell the Danmark. All of them who could make themselves understood, though, had the same story in substance to tell. They seemed to think of nothing else but the bravery, the coolness, the kindness, and the heroic efforts made in their behalf by the officers of the ship they deserted and the one which sheltered and succored them. These features of their narratives were so prominent that they had almost lost sight of the causes which led up to their transfer. "We left Tilbury docks, London, March 28." Said he. "and had everything pleasant until about noon, on Friday, April 5, when we sighted the Danmark in a disabled condition. She lay rather low in the water and looked to me as though she were sinking. We put out a boat, forty-five fathoms of chain, and about three hundred yards of rope, and proceeded to tow her, making about half speed, which would be about five knots. We supplied them with some few provisions, of which they were short. The next morning it was found that the Danmark's broken shaft had caused serious damage, and that she was in a sinking condition. The Missouri began throwing overboard part of her cargo, the portion thrown over consisting of bales of rags and wool. The transfer of the passengers was also commenced about the same time, and from 8 in the morning until about 4 o'clock in the afternoon the men worked hard at both jettisoning the cargo as fast as was found necessary and transferring the passengers in the meantime. The sea was rather rough, but everything went well, and by dark we had all of the Danmark's passengers and crew aboard, and under the circumstances they were made quite comfortable, it not even being necessary for our party of four to give up their bunks in the forward end." Miss Bena Pearson, who lives on Capitol Avenue, Omaha, Neb., was one of the twenty-eight cabin passengers on the Danmark. She is an intelligent young lady and was returning from a visit to her native home. "When the crash caused by the broken shaft aroused us", she said in describing her experience to an Associated Press representative, "about 4 o'clock in the afternoon, we knew that something serious had happened, but the officers and crew were so assuring in their declarations that there was no danger that we never felt that we were doomed. They would not tell us just what had happened, but we could guess we were in a dangerous plight. When the Missouri picked us up we were glad, but we were much more glad when we (3)were taken off. 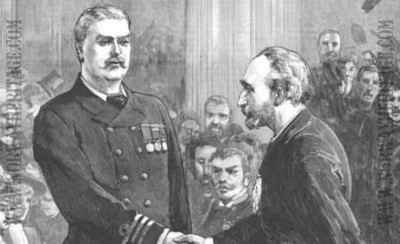 Everybody was unusually calm for such a trying time, more particularly the officers and seamen of the Danmark who did everything in their power to help us, and I am sure that no one could either expect or receive better or more considerate treatment than we did". "When it was decided to transfer us we walked down the ladder to the open boats, and when we got to the Missouri they tied a rope around our waists and hoisted us up. They did it so tenderly and carefully that we experienced no inconvenience to speak of. Like most of the others, I lost everything I had except what I had on. No effort was made to get at the baggage, because it was out of the question, and only such things as hand satchels, bundles, and other packages easily portable were thought of. We were glad enough to save ourselves, although there was no time when I had the slightest idea of going down with the vessel. A few of the women in the steerage cried and displayed their fears in other ways, but there was nothing like confusion or panic, and I can only attribute the calmness of the passengers to the cool and calm efforts of the ship's officers and crew." Many other stories were told by the shipwrecked passengers, but they were all of one tenor. And words of praise for the coolness, bravery, and kindness of the Danmark's officers were spoken in great profusion. When the passengers were taken off, the Missouri headed at once for the Azores, and a delicate task was necessary to be performed at St. Michhael, where it was absolutely necessary to leave a part of the 705 people. 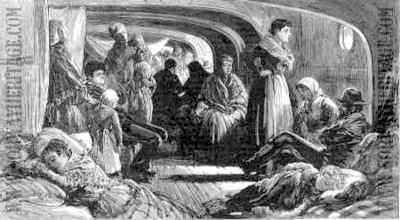 As in the case of transfer from one ship to the other, women, children, and families were given the preference, and the Missouri, in accommodating this portion of the ship's load, managed to accommodate all of this class, so that those who were forced to turn back(4) consisted of either n married men or married men who were traveling alone. There was no difficulty in securing a plentiful supply of provisions at St. Michael, but prices were exorbitant. There was no grumbling, however. Capt. Murrell cheerfully paying whatever was demanded. Charles Lorup of Philadelphia, who had been on a visit to Copenhagen, was one of the steerage passengers, being accompanied by his wife. When the word was given for a transfer the wife dropped everything except a cage containing two pretty canaries, which she prized more highly than anything else, and she stuck to them tenaciously until she landed in this city. In the great shed of the Red Star Line at the foot of Washington Street, a table loaded down with eatables had been spread, and as fast as the passengers left it they were provided with accommodations until tonight, when at about 11 o'clock a special train on the Pennsylvania Railroad conveyed nearly three hundred of them toward their destination in the West and Northwest. The remaining sixty-five or thereabout who were destined for points in the East also left tonight over the same line. A majority of those bound West are going to Minnesota, Dakota, and other points in that section, while a few go as far as Washington Territory. They will be accompanied by agents of the Thingvalla Line and will be reprovisioned at Chicago. Gilbert Jesperson, the ship's surgeon of the Danmark will go to New York tomorrow and thence to Chicago soon after. Capt. Murrell will be lionized for the next day or two as a mark of the esteem in which he is held by those who know him and of his gallantry. He brought the Missouri to this port today on her maiden trip, she having made but two voyages previous to this, and both from Baltimore. He is, though a man but twenty-eight years old, quite an old Captain, having followed the sea for some time before he was of sufficient age to receive his papers. He has commanded successively the Surrey, Michigan, and Maine of the same line, and has been remarkably free from mishaps in his career as a master. Tonight he went to Riverton to spend the night with his friend, Charles E. Davis, who is the stevedore for Wright & Sons. Tomorrow at noon, by invitation of the Maritime Exchange, he will hold a public reception at their building, and tomorrow night he will be the honored guest at the annual dinner of the Sons of St. George, which will be given in their hall at Thirteenth and Arch streets. As to the death of Engineer Kass of the Danmark, there was nothing to be learned. There were no witnesses to his tragic fate, and the only stories heard of him were simply matters of conjecture. Some suggested the idea of suicide on account of the accident to his vessel, but this theory does not obtain to any extent worth mentioning. The most plausible and most generally believed story of his death is that when he found the shaft had broken and was with every revolution tearing a larger hole in the Danmark's bottom, he made an effort to turn off the steam in order to stop the machinery. Perhaps in an unguarded moment, or a moment of excitement, becoming bewildered, he caused the accident which cost him his life. Whether it was the explosion of a steam pipe or the fast revolving broken shaft, which was responsible for it, will probably never be known. A similar case, in support of this latter theory, is quoted by the officers of the Thingvalla Line as being that of the Cunarder Aurania, whose shaft broke a couple of years ago. The engineer, in order to stop the machinery in time to prevent serious damage, was compelled to place his life in jeopardy, but he was successful, and for his daring he Ws handsomely rewarded by the passengers. The accident to the Danmark is believed to have brought about a parallel case, except that Engineer Kass was so unfortunate in his efforts that his life was sacrificed. Capt. Murrell could not state the value of the cargo which had been thrown overboard from the Missouri. The entire cargo was valued at $150,000, but only a portion of it was thrown overboard. "Although," said the Captain, "had it been necessary I would have thrown every pound of our cargo overboard. That which was jettisoned consisted principally of bales of rag waste and other light but bulky stuff stored between decks." COPENHAGEN, APRIL22.-On receiving the news of the rescue of the Danmark's Passengers, King Christian drove to the residence of the wife of the Danmark's Doctor to inform her of her husband's safety. Everything was bustle and excitement at the office of Funch, Edye & co. last night, but it was the excitement of joy and freedom from the terrible gloom and suspense which has hung over the place for several days. Up to a late hour the office was crowded with friends of the passengers of the Danmark, inquiring if their kindred and friends, whom they had almost given up for lost, were among those who landed at Philadelphia from the Missouri, and when the list of names was read off by Mr. C.B. Pettit of the firm, many expressions of satisfaction and joy were heard. It was learned at the office of Funch, Edye & Co. that the passengers leaving Philadelphia at midnight would probably come through on the slow train, which arrives at Jersey City at daybreak.. No intelligence as to any person having come in on the Missouri having arrived in this city was received up to a late hour last night. Clarifications: (1) "came aboard"---on trip from Azores to U.S. Everyone came aboard the Missouri from the sinking Danmark. (2) asked by reporters to see the baby. (3) "Missouri picked up"---first began by towing---later "took passengers off" (4) But they didn't "turn back"-rather left at the Azores for a later ship sent by the Thingvalla Line to transport them to U.S.